This Halloween Northern Liberties neighbors are celebrating the permanent protection of one of the most imaginative and unique green spaces in Philadelphia–The Spooky Garden. Imagine a long slice of green space extending through the middle of a city block of row homes from 4th to Leithgow Street. This “community backyard” provides a shady natural habitat for humans, wildlife, and native perennials alike. Communal garden beds grow herbs, jalapeno peppers, rainbow chard and squash blossoms, raspberries, and pumpkins in dappled patches of sunlight that filter through the canopy of a majestic 100-foot-tall Elm Tree. Now, envision a seven-foot-tall werewolf, skeletons, projections of classic horror movies and two 1950s-era mannequins woven into this gardenscape. These are just a few of the Halloween decorations that fill Spooky Garden during their annual Halloween event. Every Halloween the Spooky Garden features such surprising delights as wacky wood piles, a creepy composter and a haunted BBQ. The Spooky Garden distinguishes itself from your average haunted house with hauntingly beautiful displays that are intentionally spooky, but not scary. Instead of gore, the Spooky gardeners create unique handmade decorations and shadowy scenes constructed with found objects, repurposed materials, and lighting. Many of the folks behind the Spooky garden have had experience as scenic artists and every year they design new vignettes. In the 1980s, the land, which has become Spooky Garden was vacant. It was owned by the City and was littered with abandoned cars, appliances, tires, and trash. In the 1990s, neighbors began to clear the properties and to green the abandoned land with flowering shrubs and a koi pond. They cultivated a wild, magical feeling. In 2002, neighbor Greta Alexander (a long time resident and former gardener) suggested they open the garden during Halloween and display pumpkins carved during a neighborhood pumpkin carving party. 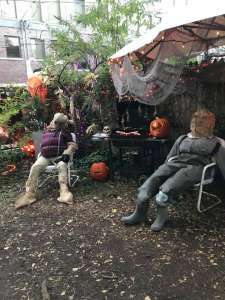 Now with the leadership of Linda Soffer, Lead Gardener, her husband Seth, and her creative cadre of neighbors, the event has evolved and 15 years later the annual Halloween festivities at Spooky Garden are a must-do. 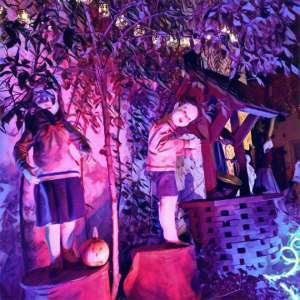 Families from the neighborhood and surrounding area make the garden a Halloween destination, lining the street as they wait for their chance to experience the multi-sensory garden displays. Last year, the garden welcomed nearly 1,800 visitors to its free event. Even the police attended in costume! Over the past twenty years, as neighbors dedicated more and more time and creative energy to caring for the Spooky Garden and the Halloween event grew, real estate development in Northern Liberties increased rapidly. At a time when vacant land filling in with new housing and neighbors, the role of the garden as a gathering place and a green open space became all the more essential for quality of life. In 2004, neighbors Dennis Madigan and Karyn Gerred were concerned about the land security of the garden as development was increasing in Northern Liberties. Dennis and Karyn were instrumental in starting the original preservation efforts of Spooky Garden. Then in 2010, the two properties that the garden occupies were listed for sale by the City. Prior to this listing, Linda and her neighbors started a campaign to save the garden, which received local media attention. Councilman Darrell Clarke stepped in to stop the sale of this valuable community space and facilitated a lease agreement between the City and NGT. The gardeners were relieved to have stopped the imminent loss of the garden, but they knew that the year-to-year lease did not provide the secure future for the garden they were looking for. They continued to demonstrate their commitment and passion for tending and animating the garden, and in 2016 Council President Clarke approved the transfer of property ownership from the City to NGT so that it would be secured as open space forever. He also agreed to support the request of the gardeners to expand the Spooky Garden on an adjacent vacant property, which doubles the current footprint for gardening and haunting purposes. This Halloween, we celebrate the preservation of the Spooky Garden after an almost decade-long campaign. Thanks to the vision, hard work, advocacy of Linda Soffer, her family, neighbors and friends, the Spooky Garden is here to stay! We hope you stop by Spooky Garden tonight in your best costume for a faboolous time! Don’t miss the Spooking station for a startling surprise. © Neighborhood Gardens Trust, 2018. All Rights Reserved.